Valentine's Day is all about chocolate! Want to spice up your Chocolate Valentine's Day? 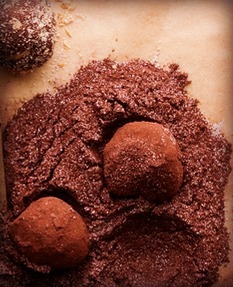 Make these fabulous Spicy Chocolate Truffles. Love is all about chocolate! This recipe is from Joan Coukos of Chocolate Moderne and appeared in Food and Wine Magazine. I had 5-spice Truffles a few years ago at an event, and I've been looking for a good recipe like this that replicates the flavor! Have a spicy Valentine's Day! In medium saucepan, bring cream and corn syrup to boil. Put bittersweet chocolate in medium bowl and pour hot cream over it. Let stand for 2 to 3 minutes, then whisk until smooth. Whisk in butter. Refrigerate until firm, at least 1 hour. Meanwhile, in small dry skillet, toast coconut over moderate heat, stirring constantly, until just lightly browned, about 2 minutes. Transfer to small bowl and let cool. Stir in cardamom, cloves, 2 tablespoons sugar and 1/4 teaspoon cinnamon. In another small bowl, whisk 1/3 cup of sugar with remaining 1 tablespoon of cinnamon, the allspice, and the chipotle and ancho chile powders. In third small bowl, whisk 1/4 cup of cocoa powder with five-spice powder and remaining 1/3 cup of sugar. Put remaining 1/4 cup of cocoa in another bowl. Line baking sheet with parchment paper. Scoop up level tablespoons of the ganache and drop onto parchment. Place baking sheet in refrigerator for 10 minutes. Using your hands, roll each mound of ganache into ball; you may have to cool your hands in ice water periodically while you work. Roll 1 truffle at a time into 1 of coatings. Return truffles to baking sheet, cover loosely and refrigerate until chilled.